Picking the right plan for voice calls and text on a network is sometimes be likened to navigating a mine field with the plethora of tariff plans offered by telecoms which are not that dissimilar. And so it pays for one to have a second opinion on this matter. MTN Nigeria has quite a few tariff plans which includes notable plans such as the TruTalk, Tru Talk+, Supersaver, Supersaver+ plans,MTN Zone, Smooth Talk and iPulse. These plans differ in the way the calls are charged after the first minute. With the Supersaver plans one is charged 42 kobo per second (25.2 Naira per minute) for the first minute and then subsequently 10 kobo per second (6 Naira per minute) for the rest of the day for MTN to MTN and 30 kobo per second (18 Naira per minute) for Other networks. With the Supersaver+ plans one is charged 40 kobo per second (24 Naira per minute) for the first minute and then subsequently kobo per second (9 Naira per minute) for the rest of the day. On TruTalk, MTN to MTN calls are charged at 20 kobo per second (12 Naira per minute) while calls to other networks are charged at 26 kobo per second (15.6 Naira per minute). Tru Talk also offers a choice of 11 numbers that users can call at 11 kobo per second (6.6 Naira per minute). TruTalk+ is somewhat similar to TruTalk but the tariff is pegged at 11 kobo per second (6.6 Naira per minute) to all national networks after a daily access fee of 5 Naira. Smooth Talk is similar to Supersaver+ starts at 40 kobo per second (24 Naira per minute) for the first minute and 20 kobo per second (12 Naira per minute) for subsequent minutes, however this plan requires that one is already subscribed to a data bundle to enjoy the rates. The MTN iPulse tariff is a plan crafted for university campuses and offers reduced call charges starting at 40 kobo per second (24 Naira per minute) for the first minute and 11 kobo per second (6.6 minute per minute) for subsequent minutes. This article would disregard the MTN iPulse, Zone and Smooth Talk because of the conditions they require. Smooth Talk requires a data bundle which raises the cost, iPulse works at university campuses and as such doesn't apply to everyone. While MTN Zone rates depend in the area and thus is unpredictable. 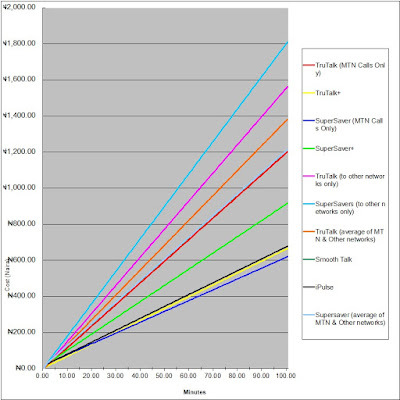 At a glance, it is easy to see that the TruTalk+ plan is more frugal choice as it offers the cheapest call rates regardless of which network one calls. However before you choose TruTalk+ or any other plan you should consider how many of minutes you use everyday or which networks you call. 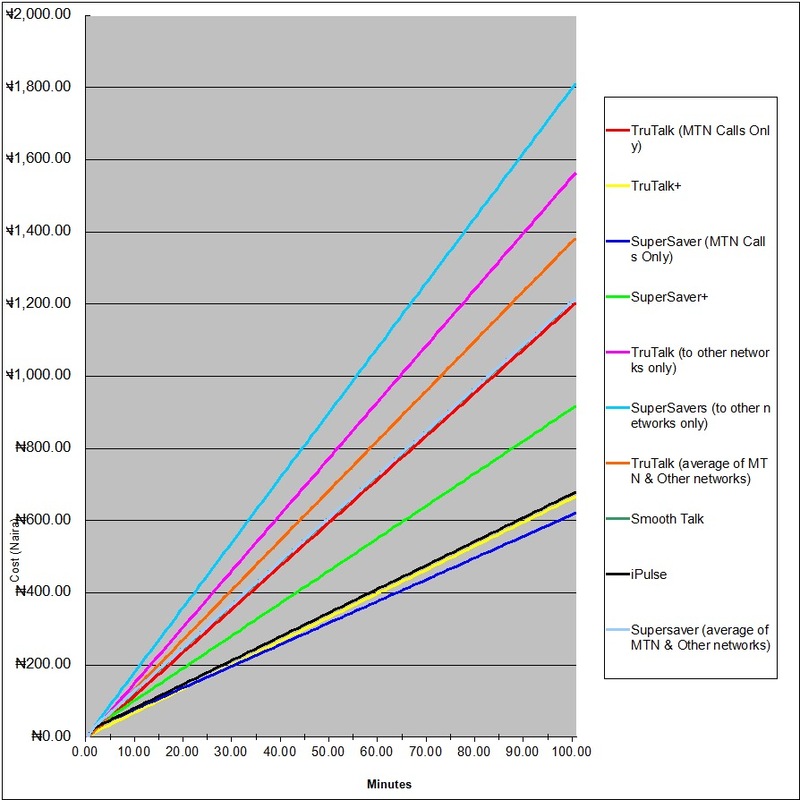 In order to help you guys pick a suitable tariff plan i would be breaking down users into categories based on the number of minutes used daily. This is a no brainer option, TruTalk+ users starts saving you money from the very first minute. Although if you only make calls to MTN lines, the Supersaver offers more savings. The class refers to people who tend to call a limited set of people regularly. Although i would want to recommend TruTalk+ as a hassle free tariff plan. You might want to look towards The TruTalk plan especially if your group consists of 11 or fewer people. One could easily save money by adding those frequent callers to their Family and Friends rooster. The TruTalk plan is also great for parents buying phones for their kids. Overall if you are looking for a hassle free tariff plan, your best choice is going with the TruTalk+. It is the cheapest plan available on the MTN network, the daily access fee of 5 Naira is well worth even for the most thrifty of users it once you make a minute call daily.